A mum-of-two who is battling cancer is charting her most personal of journeys online to serve as hope and inspiration to others. Clare Davies-Eaton, 41, from Grimsby, is currently receiving treatment for throat cancer at the Queen’s Centre for Oncology and Haematology at Castle Hill Hospital, Cottingham. 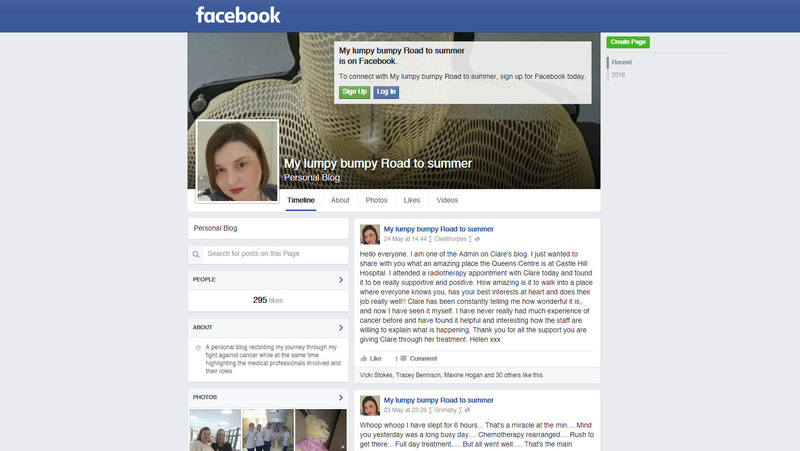 Having been diagnosed just 11 weeks ago, she has started a facebook page, ‘My lumpy, bumpy road to summer’, which she is using to update followers on her progress and, crucially, to raise awareness of head and neck cancers. Clare also uses the page to pay tribute to the people who are supporting her through her treatment, including family and health professionals. The first signs of a problem came late last year when Clare experienced a sore throat, and found a lump in her neck shortly afterwards. Clare went to her doctor and, after numerous hospital referrals, scans, tests and procedures, and the removal of her lymph nodes in February, she finally received her cancer diagnosis on 11th March 2016. Clare is now part-way through courses of both radiotherapy and chemotherapy at Castle Hill Hospital, and says the diagnosis turned her world upside down. “In the weeks leading up to my diagnosis, I hadn’t really considered that it might be cancer so when I was told by the doctor, I went into shock, I just didn’t know what to say. In the space of five minutes I felt lost, like my world was falling apart, but then I heard the word ‘treatable’ which gave me hope that I could battle this. “I have set ‘My lumpy, bumpy road to summer’ page up to track not just my journey but to highlight the work done by all the dedicated professionals that will help me along the way. I’m also hoping to raise awareness of head and neck cancers and encourage people to be more alert to the signs. Throughout her cancer journey, Clare has been supported by countless health professionals from Diana Princess of Wales Hospital in Grimsby and, more recently, from Hull University Teaching Hospitals NHS Trust, including Therapy Radiographers, Dietitians, Maxillofacial specialists, ward staff, and Macmillan Clinical Nurse Specialists. “My first visit to the oncology unit at Castle Hill was not what I was expecting at all, it seemed more relaxed than a hospital. “I went for my radiotherapy mask fitting, and the Therapy Radiographers were absolutely brilliant, so patient, understanding and compassionate, but at the same time very honest when answering my questions, which is just what I needed. They really helped me feel at ease. “All of the health professionals who have helped me along my journey so far, from my stoma nurse to the dietitian, the Oncology day ward staff and staff on ward 30, I’ve been so impressed with the efforts they go to and the care and compassion they show. “Clare is an amazing person. She was so scared about what we needed to do to plan her treatment, but we talked her through it and she managed everything we needed her to do. “Her blog has given us a real insight into what it’s like for our patients, and it’s great for us to see that she really appreciates what we are doing; it’s been a brilliant morale booster for the teams involved with her care. “Clare is fighting a disease that none of us should have to, and it shows her bravery, that she is not only going through all the treatment and dealing with its side effects, but she’s also trying to raise awareness of the disease and of radiotherapy, so that it can be caught earlier and be more treatable. To read and follow Clare’s blog, visit My Lumpy Bumpy Road to Summer.